Thinking of replacing your home’s façade? If you are, you definitely want to consider going with aluminum soffit and fascia material. Aluminums durability, and low maintenance makes it a superior choice over other types of building material. First, let’s describe these two seldom understood terms so you understand what they are and the functions they perform to keep your home beautiful and well-maintained. A Soffit (sometimes referred to as an eave) is most commonly installed underneath porches, archways, or even under a staircase. It can be used, however, anywhere that a ceiling space needs to be covered. Often installed for aesthetic purposes, a soffit also provides protection from foul weather and swirling moisture. The Fascia is a vertical band of material that covers the roof edge as it is seen by an observer. Together, the two architectural structures form a barrier designed to keep the interior of your home protected from the elements, and the outside looking wonderful. You can discover all of the different options and styles in this handy soffit-buying guide from Menards. 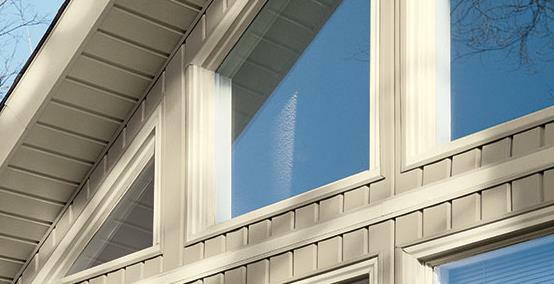 Soffit and fascia comes in several materials including wood, vinyl, and steel, all of which have their benefits, but for a long-lasting, low maintenance, and easy install, many homeowners prefer to go with the tried and true endurance of aluminum. Here is a list of 5 reasons savvy homeowners choose to go with aluminum over other materials when it comes time to put a new face on their old home. Lasting Protection and a Lifetime of Comfort – Aluminum has long been heralded for its ability to stand up to tough weather, so there is no question about how long it can last. Aluminum helps provide the proper amount of ventilation needed to provide your home with excellent airflow. A well-moderated airflow throughout the home also reduces energy costs by carrying away overly cold, or heated air that otherwise can become trapped. This trapped air can be the cause of ice building in the winter, or causing your cooling system to run excessively in the summer heat. Environmentally Friendly – Since it is a totally recyclable material, aluminum makes it easier on the environment by reducing water pollution by 97%, and air pollution by 95%. Because aluminum soffit and fascia’s require such low maintenance, materials like paint, stains, and other chemicals are not required. Looks GREAT! – When most people think of metal materials, they often think of something that looks cold, dull, grey, and unwelcoming. But, that isn’t the case with aluminum, which comes in a variety of colors to match your homes exterior décor. Low Maintenance – One of the best reasons to choose aluminum is due to its ability to remain in good condition with very little effort on the part of the homeowner. Wood, and vinyl can become faded, and look as if the sun took a personal disliking to it after only a few years, while aluminum colors are baked in, and once installed will continue to look great and protect your home for up to 20 years. Easy Installation – The soft, malleability of aluminum makes it a quality choice for homes with steep rakes, odd corners, and tight spaces. Unlike, other materials which must be installed only when the weather conditions are right, aluminum is an ideal choice for installations during any time of the year. There really is no “wrong” answer when it comes to which type of materials is best for your home. By doing a bit of research into your area’s weather conditions, and storm severity, you will be able to figure out which option is best for you. DON’T FORGET, even though this article may make soffit and fascia installations sound pretty easy, it is not a job for the weekend DIY’er. There are a myriad of intricate details to understand regarding this type of construction material, and it would be wise to locate a qualified professional to handle your installation. Jackson Exteriors is a family owned and operated business. Founded in 1982, we proudly offer a combined 100 years of experience in residential insulation and exterior construction. For more information, or to schedule a free consultation, please call us today at 1-815-459-7444. Every year you should do a rudimentary check of your exterior surfaces to ensure that they are good to protect your home for another year. Many factors can affect the performance of durability of your soffit and fascia, no matter what material it is made from. By performing a periodic visual inspection, you will be better equipped to decide if it’s time for a bit of maintenance, or a repair. One thing to look for each spring is the presence of nuisance insects, and bugs that may have decided to set up camp in your home. Bees, hornets, and wasps are just a few of the bothersome bugs that you certainly don’t want taking up permanent residence under your front porch. While you’re up there checking for unwelcomed guests, be sure to keep an eye out for molds, and mildews. The last thing anyone needs is a home full of mold, so if you do see a spot where spores develop frequently, you should be able to clean it up with a broom, or brush dipped in a light solution of bleach and water. If the mold repeatedly returns to the same spot, you may have an issue with your installation, and you should have it checked out by a professional so you can terminate the issue. Now you should be ready to make an educated decision on which material you’ll choose for your home. Click here if you would like to learn more about Jackson Exteriors installs, and to set an appointment.